I have to say that I'm totally miffed why everyone is ignoring C BASIC (JADE for the C++ crowd) when we have shown the same program running on Windows (32/64 bit), Linux (64 bit), OSX (64 bit) and Android (ARM native compiled). All I've heard from everyone is that BASIC is dead and no one takes it serious. C isn't dead and the ease of use of BASIC as a syntax seems like a great match. With all the cool code and seemingly bright BASIC programmers behind it, why have they gone brain dead with Microsoft's demise? The only thing I can think of is that all the BASIC programmers are retired or about to do so and learning anything else is a waste of time. I have a few more years left in me and it couldn't be a better time in (computing) history to capitalize on the dramatic shift how business and the tools being used has opened up new opportunities even as individuals can profit from. C BASIC (JADE) will have you programming in C/C++ in record time without a major learning curve. There is nothing new here folks. I have been a BASIC advocate for over 35 years. I think C BASIC is a way to extend BASIC's useful life by transitioning it to C. Do we really need to use BASIC to C translators that create unreadable C code which is in essence a subset of the true power of C? What I have noticed developing C BASIC is that it transforms C's multi-meaning symbolic syntax to understandable flow and the C syntax that isn't masked with C BASIC syntax become easier to read. At the end of the day, people don't care about the implementation details. They care about the end result. If we take a look at the most popular languages of the non-C variety, what do they have in common? They're easy to use, and don't require getting one's "hands dirty" with lower level stuff. Back when BASIC came with all home computers, that was the big promise. Today, I believe that is what still determines the popularity of a programming language. That, and a community where people can talk about and share code/tips for a given language. I see it as an idea being sketched out. I don't think it is being presented as a finished product. Presumably a light weight compiler is the next step, if that should seem like a good idea. Being able to use C libraries directly is a big advantage. Making .bi files is a joyless task. I kinda liked the Go programming language but they have fundamentally rejected the shared library concept. However shared libraries are the only really successful example of code reuse. Also the internal Go libraries where too big and had too many things I would never need. The ability to return multiple values from a function provides a really great way to do error handling. You can take or leave a returned error signal as you wish. That is much better than the ugly try/catch situation in Java. I would like a light weight programming language with a simple object orientated system such as with Go. I also would want to be able to do GUI's and graphics very easily, have access to shared libraries and be able to insert assembly language statements (in Intel syntax!). The C BASIC concept unfolded as multi-directional projects trying to find the best way to convert BASIC code to C. At first the direction was Nimrod as a transitional language to eventually get to C. Charles presented the C BASIC concept as a way to make his C emitter code look more like BASIC using the C preprocessor to redefine C symbols. Armando and I expanding on the concept to create JADE and C BASIC variations of Charles's initial thrust. Charles has contributed his C BASIC Class Library to the project and the last I heard is working on an expression parser to make using his class library easier to use and more BASIC like. I'm overjoyed how well things have worked out to this point and looking forward to where Charles is going to take this next. One of the members of the FreeBASIC forum is keeping the flame burning with the C BASIC thread by introducing GObject Introspection as a way to handle the deficiencies of C. I tried the Hello World Greeter example and thought I would bring up the concept here. * The #TutGreeter is a class to display friendly greetings. * The entity to greet. * Allocates a new #TutGreeter. * Return value: a new #TutGreeter. * Prints a friendly greeting. I'm sorry for taking so long to get back to you on your question about if I could compile 64 bit Windows C applications under Wine using gcc 64 bit. 1/16/2014 8:55 PM <DIR> . 1/16/2014 8:55 PM <DIR> .. I tried to compile your CBasicStringClassLibrary under TDM-CGG-64 and it defaulted to a 32 bit executable. When I forced the -m64 compiler switch, this is the message I got. Ok, I think the question is: can Wine64 run both 32bit and 64bit ms-windows apps, in general. I tried running the 64 bit version of Notepad.exe from Windows 7 64 bit with no luck. 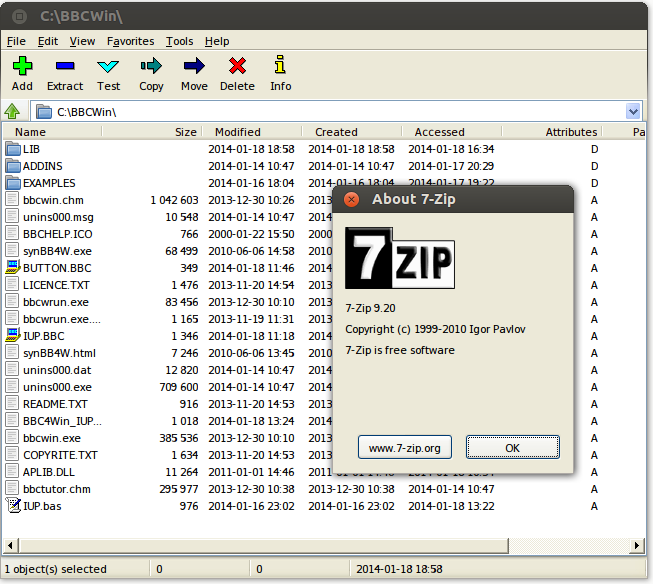 Here is the 64 bit Windows version of 7-Zip running under Wine. FYI: ScriptBasic Windows 64 bit runs on Wine. I tried the version that AIR compiled awhile back with TDM-GCC-64. (SB 2.1) If I can find a 64 bit version of Perl for Windows 64 bit, I will try to compile the SB 2.2 release for Windows 64 bit under Wine. It seems Wine is emulating a 64 bit version of XP.